○ Opening hours: 11.00-17.00 Admission from 11.00, closing at 18.00. 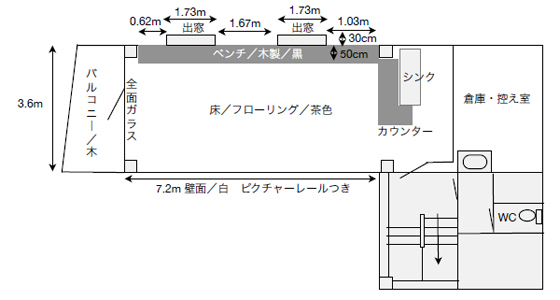 ※ To use on a Sunday, an extra fee of 43,200 yen (incl. tax) will be added. ※ To use on a national holiday, an extra fee of 21,600 yen (incl. tax) will be added. ※ Bookings are accepted up to one year in advance. 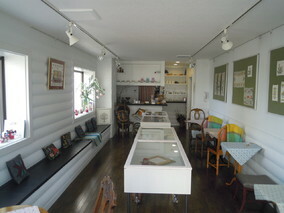 ※The gallery wavers responsibility regarding any potential trouble regarding the dealing with the sales and buyers. The staff of the Gallery will be responsible for maning the café and the register. We recommend that exhibitors visit and personally approve the gallery before booking. 1. Booking When booking, please explain the content and form of the exhibition (paintings, advertising posters, photos). If you can’t personally visit the gallery, please explain the exhibits through via mail. The Gallery reserves the right to turn offers down, when they are seen as differing from it’s artistic direction and asks for your understanding. 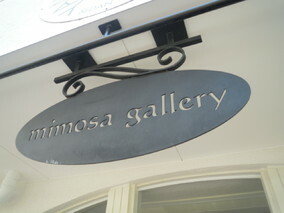 Note that it is also possible to hold workshops[Perhaps this should be in the earlier section, ’About Gallery Mimosa’?]. 2. Tentative Booking When booking please specify the approximate date and time when you would like to utilize the Gallery. 3, Completing the Booking To complete the booking, you will need to pay half the price for the booking to the Gallery, in cash or via bank transfer. 【Attention】If the booking fee has not been paid within two weeks after the booking, then the booking will be cancelled without further notice. ・Bank transfers [INTERNATIONAL BANK ACCOUNT INFORMATION] ※In the message field write “Mimosa Gallery Booking Fee”, and also state the booking dates. 4. Completing payment The remaining half of the payment can be paid or transferred when setting up the exhibition. 5. In case of cancellation Regardless of the reason, when canceling a booking the first half of the fee will not be returned. 1. Someone should be present at all times during the exhibition. The Gallery does not take any responsibility for theft or damage. 2. If substantial damages occur to the wall, flooring, or fixtures, a repair fee will be charged. Please do not use double sided scotch tape or rubber tape for installing exhibits. 3. The Gallery space including the rest of the building, is smoke free. 4. The kitchen and fridge are free to use, however it is appreciated if after use it is returned to its previous state. 5. Kindly clear out packaging, flowers, or other waste when finished. 1. When shipping [Again, shipping/mailing what? ]by express messenger, please address it [Who is it? ]to Yamanasha Hemslöjd so that it arrives before 5 pm. If you wish to deliver it yourself, please do so on Mondays around noon, and after 11 am. 2. After the exhibition finishes, if you want to have the artwork shipped with express delivery, please prepare the payment slip yourselves. The staff [Is this the Gallery staff? Then maybe you should say ’the Gallery staff’]will pack the items carefully to make sure that nothing gets damaged. 1. DM is the responsibility of the client[Does this include printing or just content development? Maybe they should clarigy along the lines of: Development and creation (printing etc) of DM]. Before printing we will gladly double check information such as phone numbers etc. We will further provide the necessary logos, maps and the like. 2. For DM that is to be displayed in the Gallery and store, we recommend a printing volume of 100 copies. 3. We will put DM up on the Yamanashi Hemslöjd bulletin board as well, therefore please provide one A4-sized poster as well. Distribution in other advertisement venues or bulletinboards is the responsibility of the client. It is possible (?) to hold a workshop related to the exhibition.